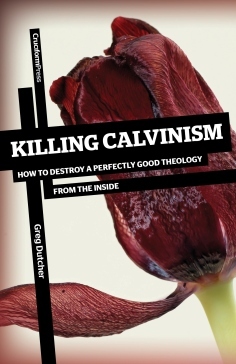 When I first heard the title of the book, Killing Calvinism, I assumed it was another attempt to repudiate the doctrines of grace. Then I read the subtitle: How to Destroy a Perfectly Good Theology from the Inside. Fortunately, withing a few days the author, Greg Dutcher, offered to send me a copy. Within 15 minutes I knew it was a book that I would be recommending for a long time. It is a book that is desperately needed, full of biblical wisdom and easily accessible. Dutcher is a gifted writer. As my late friend, Ernie Reisinger, loved to say, he puts the cookies on the lower shelf. That doesn’t mean that the book is simplistic or insignificant. On the contrary, it is profound in its insights and applications. Furthermore, it could not be more timely. It is indisputable that we are in the midst of a reformation and recovery of the doctrines of grace, or what has historically been called, “Calvinism.” Both statistical and anecdotal evidence of this fact continues to mount. I believe that this is a movement of God and that it is even more widespread than recent studies indicate. As is true with any of work of God, the devil always keeps pace and seeks to steal, kill and destroy. If he cannot keep us from truth then he will do what he can to cause us to hold the truth in imbalanced and ungodly ways. Dutcher rightly understands this and writes with the conviction that one of the greatest (if not the greatest) threats to Calvinism is ungodly Calvinists. “That is,” as he puts it, “if we don’t live our Calvinism we might just kill it” (10). “We.” Dutcher writes as an insider. It is this perspective that gives the book much of its appeal. He uses plenty of personal examples of his own failures in mishandling the truth of God’s grace. As I am sure will be the case with others, most of them sadly resonated with my own testimony. It has been rightly noted that when the good goes bad it becomes the worst. That is certainly true with those doctrinal truths that are nicknamed Calvinism. The sovereignty of God’s grace in salvation is one of the most breathtaking, soul-enrapturing, mind-expanding, faith-building truths revealed in Scripture. Yet, when held arrogantly or used as an excuse to ignore other biblical truths or to justify blatant sin, it becomes distorted and misrepresented as one of the most wicked lies imaginable. As I type this I received the following comment on twitter: “I am repulsed by Calvinism because of Calvinists. I would rather be wrong than think I had to be like so many I have encountered.” Such comments ought to make those of us who believe and love the doctrines of grace weep. We are called to adorn the doctrine of God by the way that we live. It is bad enough when we fail to do this. But when our lives actually make our doctrine repulsive to those who know us, we should be full of shame and sorrow. The book is 100 pages of text with 55 footnotes and a one page Appendix on the acrostic, TULIP. It is filled with pithy statements that illuminate key points (“My three-year-old daughter knows things about me that my cardiologist does not, but I don’t think I will cancel my annual heart checkup anytime soon” ) as well as great quotes from esteemed reformed leaders, past and present (Calvin, Spurgeon, Edwards, Whitefield, Packer, Sproul, Piper, et al). The writing is engaging and easy to follow. It is the kind of book that can be put into the hands of anyone who wants to grow in the grace and knowledge of Christ. I have recommended that this book become required reading for all of our church’s leaders. I wish I could somehow require that it be read before a person leaves a comment on my blog or Facebook wall. I encourage all of my Calvinist friends to read it and pass it around. We who claim to understand much of God’s grace ought then to be the most gracious of all people. A proud, belligerent, unloving, thoughtless Calvinist is a spiritual freak who denies by his actions and attitudes what he professes in his creed. None of us is immune to such sins, but by the grace of God we need not be satisfied to let them live, unmolested, in our lives. Greg Dutcher reminds us of this and writes so as to help us access the means by which God grants the very grace that we extol. I highly recommend this book.